Do your ancestors come from Victoria in Australa? If so, have you explored the vast collection of records that is held at the Public Record Office Victoria (PROV)? 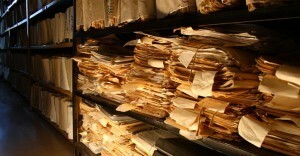 The Public Record Office Victoria is an immense archive holding over 100 kilometres of records. This impressive collection, which is housed at North Melbourne includes immigration and shipping records, criminal trials and prisons, premiers and governors, royal commissions, boards of inquiry, wills and probates, school records and so much more. 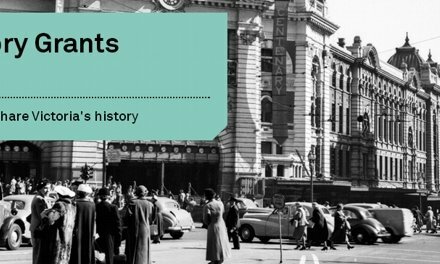 These records hold stories of the key events and decisions that have shaped the history of the State of Victoria, and date from the 1830s through until the present day. But how do you access these records? How can you get copies? That’s where our good friends at Archival Access Victoria can help. No matter if you are overseas, elsewhere in Australia, or even in Victoria but can’t get to PROV, Archival Access Victoria are your link to accessing the millions of records held at this archive. They know the records, and they can obtain copies for you. So rather than holding off on getting those records you need until you get to PROV, and then get totally bamboozled by how to request and retrieve records – let someone who knows what they are doing, do it for you, and do it efficiently. 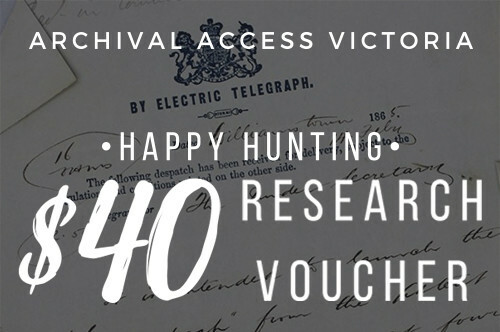 Archival Access Victoria have generously given us FOUR $40 research vouchers to give away to our customers, and entry is super easy! You firstly need to enter your name and email, or sign in with Facebook. Once you’ve done that there are four ways you can enter. You can subscribe to our blog, you can tweet about the givewaway, you can pin it on Pinterest, or follow us on Pinterest. Each option is one entry. The competition is runs from 1 April 2017 to 30 April 2017, and you can enter as many times as you like. The competition is open to anyone around the world, and the voucher is valid until the end of 2017. The voucher can be used for research or digitisiation from records at Public Record Office Victoria (PROV), or from the products that Archival Access Victoria has available for sale. Winners will be drawn at random and notified by email and announced on social media. I would love to win this $40 voucher. I have ancestors in Victoria, whom I have researched to some degree without results. I want to know what happened to them in this busy state. This would be awesome! ???????????????? This would be a fabulous prize to win – so much to choose from in PROV! Have heaps of Victorian ancestors, including a convict. Live in WA now so this voucher would make things a lot easier.